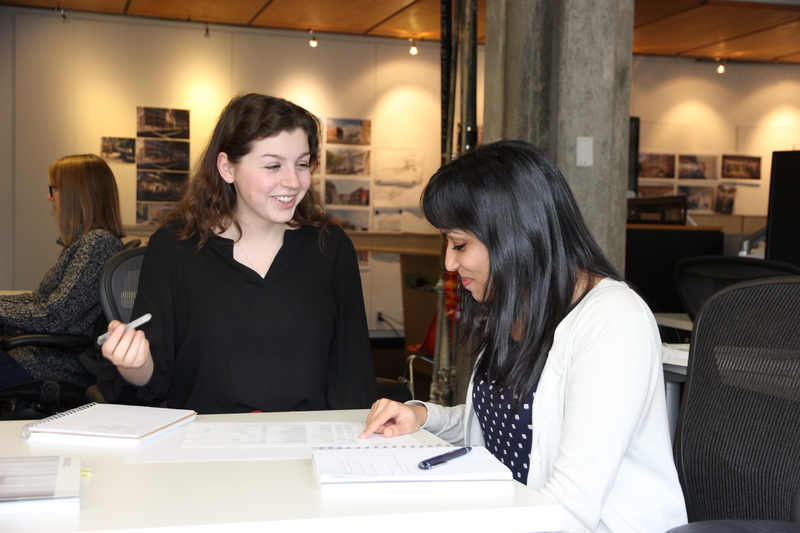 Point of View Archives | Hennebery Eddy Architects, Inc.
Each year, the firm hosts an “extern” from Carleton College. 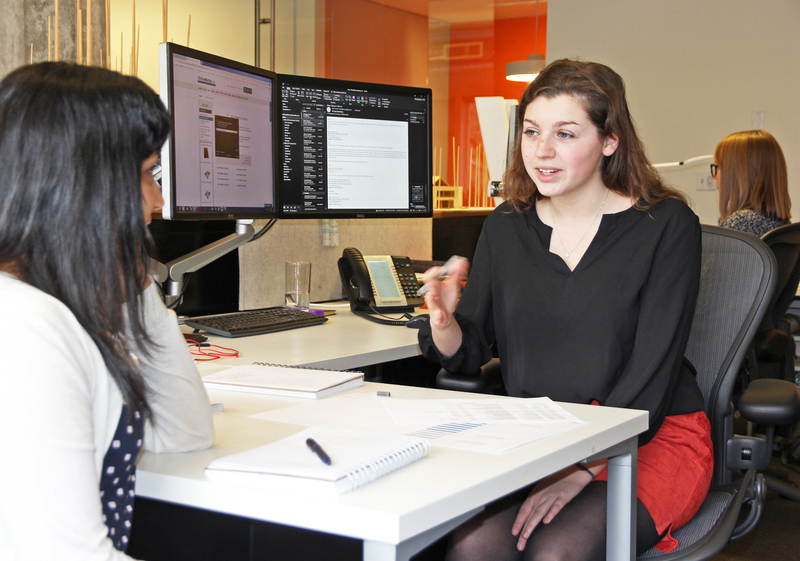 These are undergraduate students who may be interested in pursuing design studies and architect careers, and their 1-2 weeks here are designed to give them a taste of every aspect of our profession. Our most recent extern, Karen Chen, shares reflections from her November externship. Her post has been slightly edited for brevity. 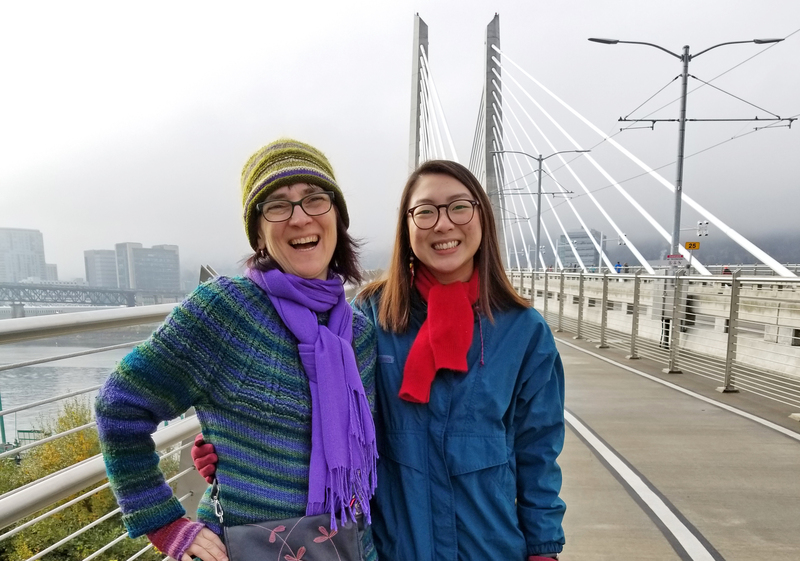 Karen Chen, right, with her externship homestay host at Portland’s Tilikum Crossing bridge. I had the privilege and pleasure of being dipped into the professional sphere of architecture for a week at Hennebery Eddy Architects. During the externship application process, I was attracted to Hennebery Eddy’s demonstrated core values of innovative design, responsive service, and the obligation that firm members take ownership in their work. They aligned with my developing interests in art, STEM, and environmental and social justice — what would be more complementary than a discipline that uses considerations in aesthetics and physical function to create structures for people to inhabit in the real world? I was exposed to an eye-opening, informative slice of the architectural industry and what professional life entailed. I gleaned a ton of knowledge and insight about architect careers simply through watching and talking with architects in various roles. Through shadowing, observing meetings, and conversations, I have a firmer handle on topics like entrance into the field, schooling, school-to-career transitions, internships, and career and job development. I both sat in on meetings about projects and accompanied architects who had volunteered to take me to tours of those project sites, including the Clackamas County fire stations, the new PDX terminal, a commercial renovation at Columbia Square, a factory cafeteria, and community college buildings. 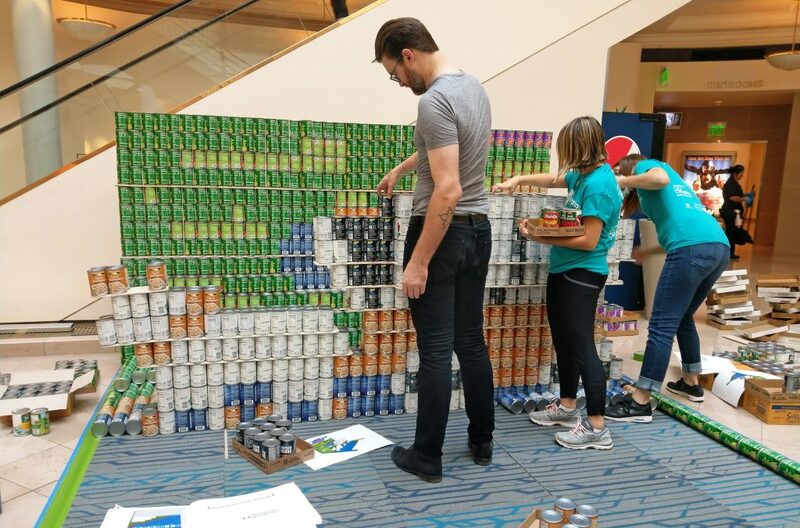 In 2018, Hennebery Eddy awarded its first Community Service Scholarship to associate Nick Byers, AIA, supporting his proposal to provide design services to a school with limited access to volunteer design professionals. 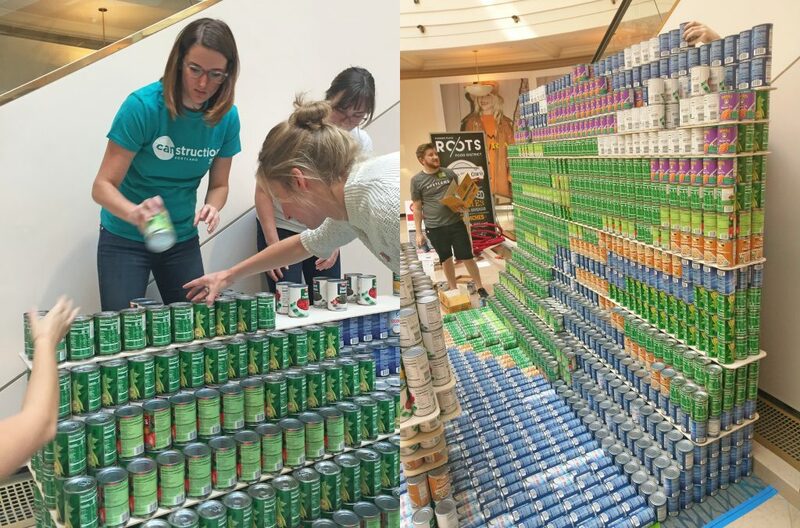 The community service scholarship is part of the firm’s larger philanthropic effort, Hennebery Eddy Gives, which provides a framework for volunteering, financial contributions, and pro bono work to support community development where we work, live, and play. Here, Nick shares the process, successes, and lessons learned from his project. 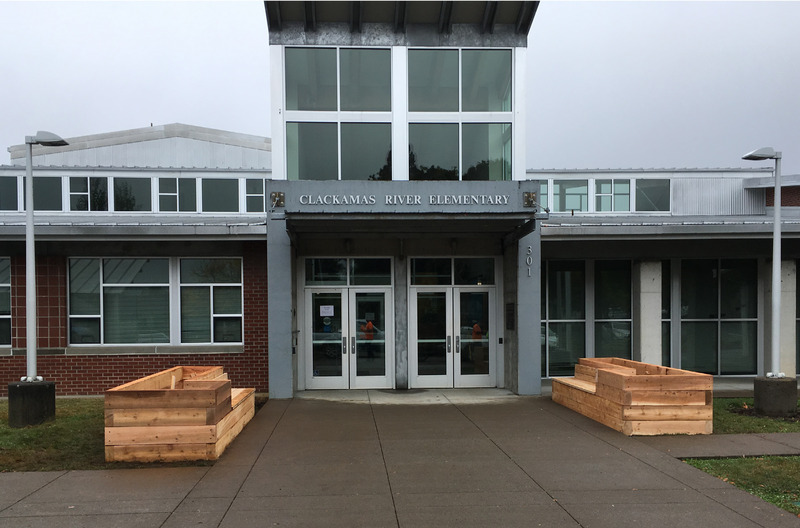 Newly constructed raised planters at Clackamas River Elementary School. 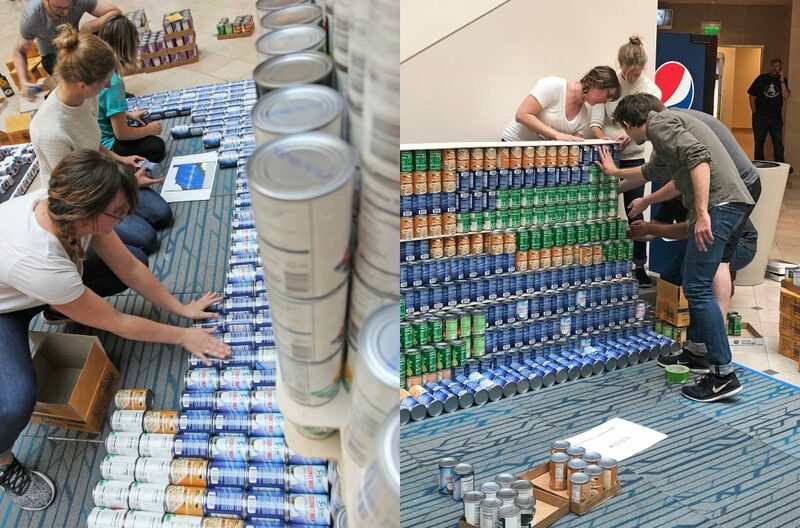 Please describe your service project. How did you conceive of it? In the summer of 2014, I volunteered with a group at an elementary school in Portland, where we assisted in improving a tired courtyard into a vibrant open space, complete with new landscaping, raised planters, and trees. The effort was led by a local construction company, and the final product was a beautiful new courtyard that gave the school a greater sense of pride and provided the opportunity to add gardening and healthy eating to its curriculum. My fond memories of this project inspired my service project proposal for Hennebery Eddy’s community service scholarship. 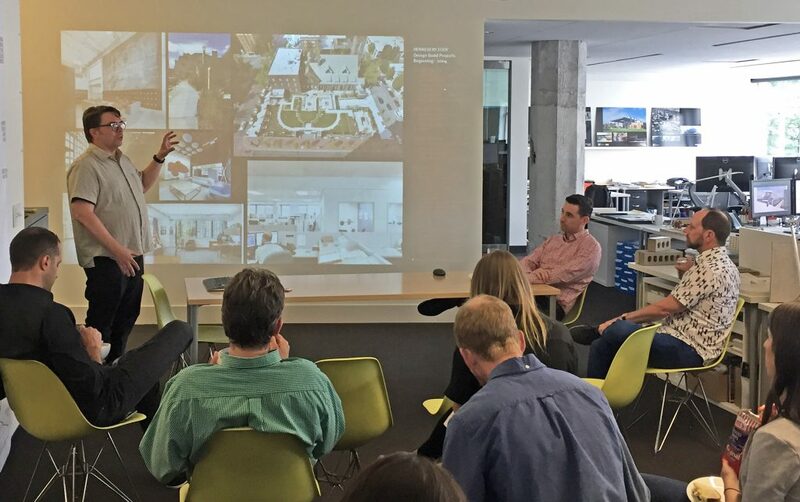 Hennebery Eddy hosted two interns this summer, both of whom are working on Master of Architecture degrees from the University of Oregon – Portland focused on historic preservation. 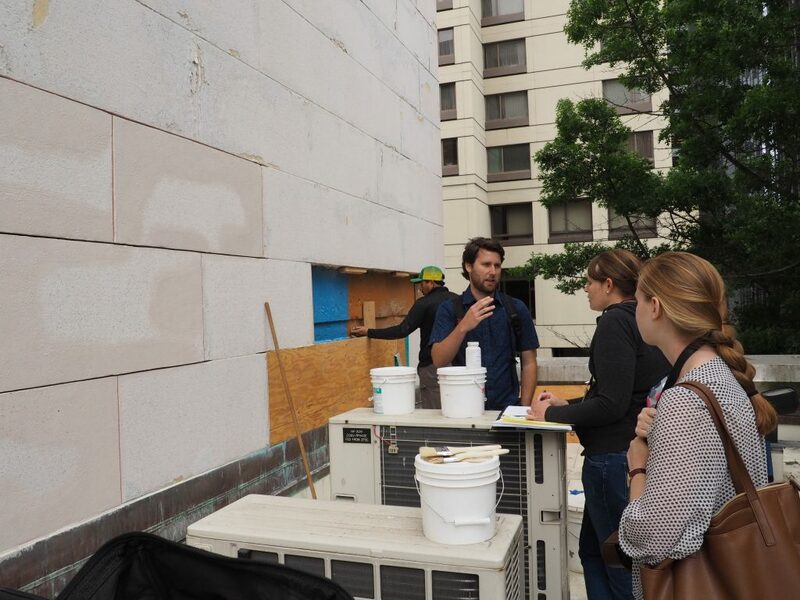 In the second of this two-part series, Shannon Hines shares highlights from her historic preservation internship and takeaways from her time with the firm. Click here for Michael Moran’s experience. 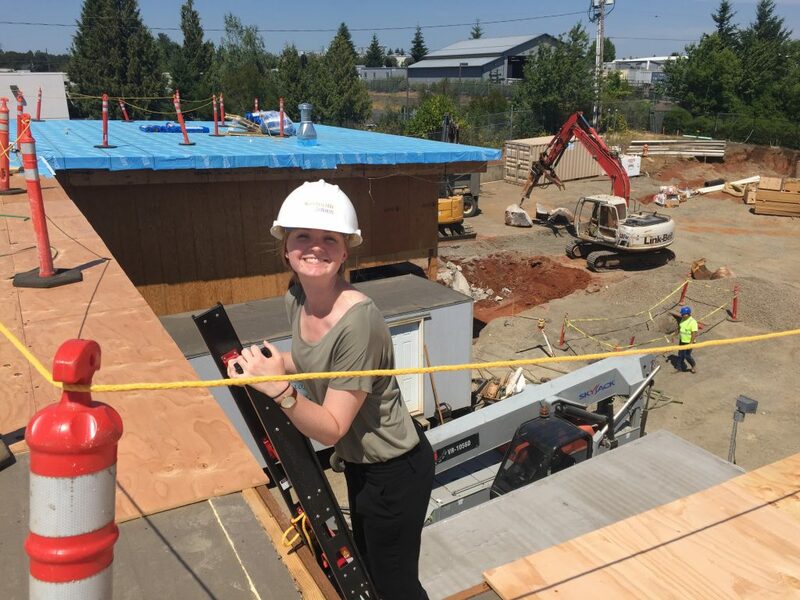 Shannon visits the construction site for Clackamas Fire District Station 16 – not a historic project, but definitely part of a well-rounded Hennebery Eddy internship! Throughout school, I have had an interest in the historic preservation side of architecture and have taken both architecture and historic preservation classes at the University of Oregon – Portland. I first learned about Hennebery Eddy through one of my architecture studios when Tim Eddy came to talk with us about the Albina Vision effort the firm had been working on and learned more when Josette Katcha came into a historic preservation class to talk about her role as a specialist in the firm’s historic resources group. This was how I learned about Hennebery Eddy’s strong historic preservation expertise. This interested me because I would be able to combine my studies in a professional setting. Hennebery Eddy hosted two interns this summer, both of whom are working on Master of Architecture degrees from the University of Oregon – Portland focused on historic preservation. In this two-part series, Michael Moran and Shannon Hines share highlights from their historic preservation internship and takeaways from their time with the firm. 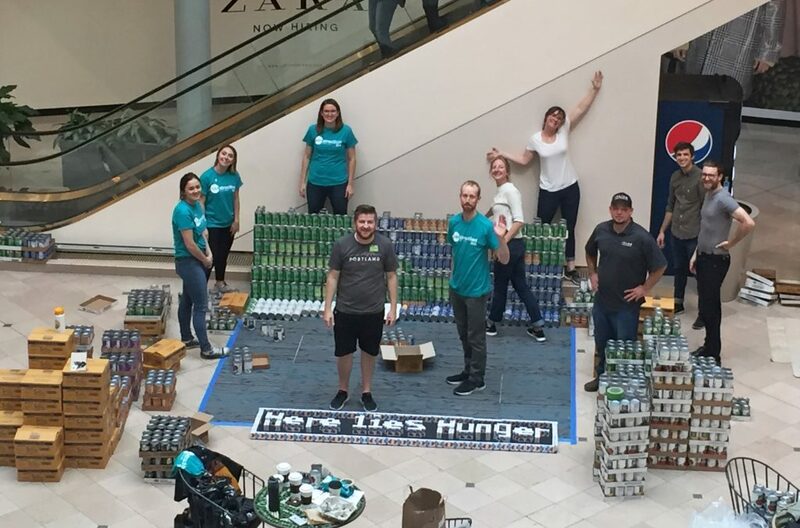 Read on for Michael’s experience, and click here to read about Shannon’s internship. Michael Moran, left, and Shannon Hines, far right, interned this summer with the Historic Resources Group at Hennebery Eddy Architects. I was first introduced to Hennebery Eddy through my second studio at U of O in Portland. We adopted Hennebery Eddy’s Albina Vision urban design concept and focused on the design of a cultural building that would connect the Rose Quarter to the Willamette River by spanning a plaza over Interstate Avenue. The studio collaborated with the Portland Opera for the program. It was great to have Tim come in to present the urban vision, and to have such an aspirational framework to provide inspiration for our designs. 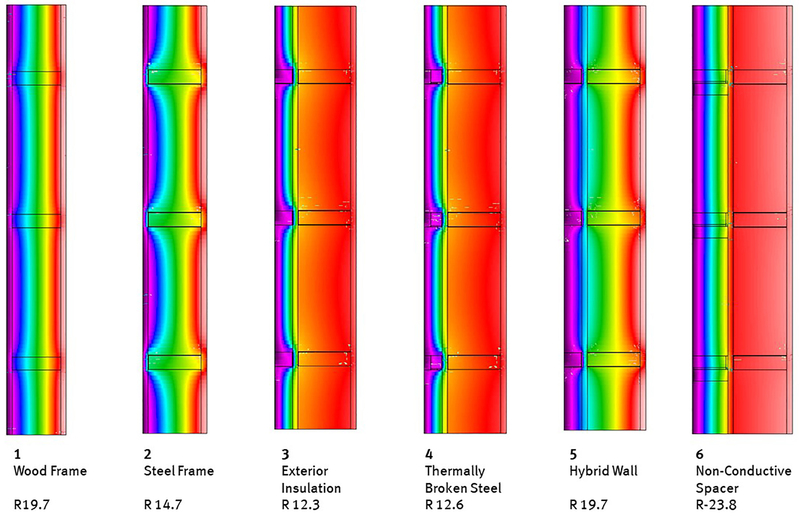 I like the philosophy of the firm, especially the commitment to thinking about the long-term life of a building. 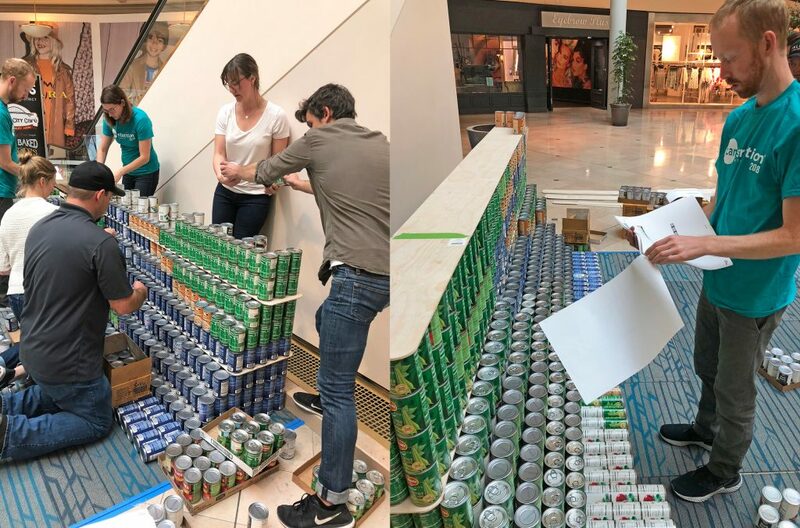 This spring, architect Monica Mader and interior designer Elyse Iverson volunteered as co-teachers for the Architecture Foundation of Oregon’s (afo) Architects in Schools (AIS) program. For six weeks, architectural design and engineering professionals visit elementary schools on a weekly basis, teaching a series of lessons that introduce students to various aspects of the industry and profession. Below, Monica summarizes their six-week residency at KairosPDX, a public charter school in NE Portland focused on serving low-income students and students of color. What was your goal for the students in your AIS program? 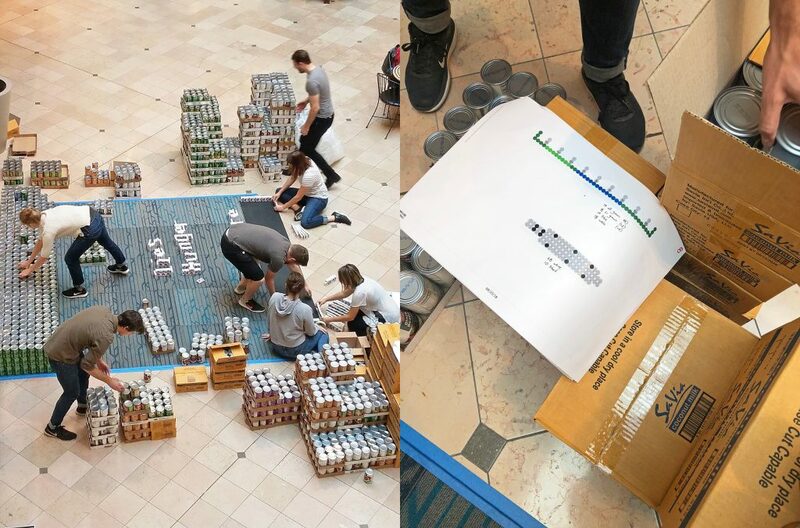 By​ ​the​ ​end​ ​of​ ​the program, we wanted the students to ​be​ ​able​ ​to​ ​demonstrate​ ​an​ ​understanding​ ​of​ ​their​ ​own community​ ​and​ recognize​ ​valuable​ ​components of a​ ​​neighborhood​ ​in​ ​relation​ ​to​ architecture. Students completed a self-assessment at the beginning of the program, sharing their knowledge and learning goals.